Seymour Duncan SH-14 Custom 5 Black Humbucker Pickup Bridge - Brand New! 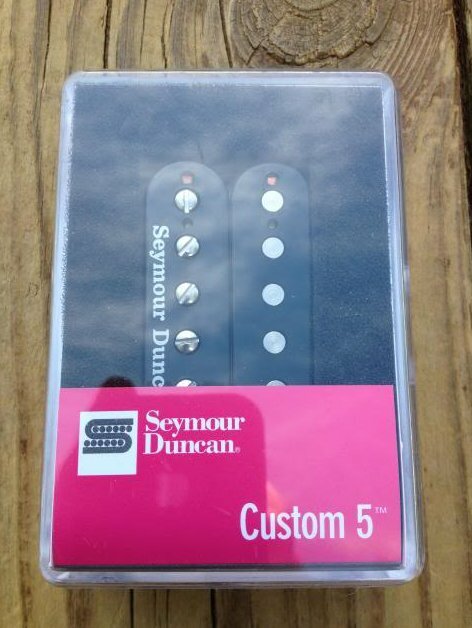 www.MyGuitarSupply.com > SEYMOUR DUNCAN - Pedals & Pickups > Pickups > Humbuckers > SH-14 Custom 5 > Seymour Duncan SH-14 Custom 5 Black Humbucker Pickup Bridge - Brand New! If the 59 Model bridge humbucker was twice as loud, it would be a Custom 5. Scooped mids, even bass & treble, and high output. Originally called the Custom Custom Custom this pickup began life in our Custom Shop from players requesting a brighter, alnico 5 version of the popular Custom Custom humbucker. It has a nice, full tone, a scooped midrange, and strikes a nice balance of bass & treble. This even reponse makes it extremely versatile and great for all types of music and playing styles. Match with the 59 neck or Jazz neck model for a perfectly balanced setup.Hand built in Santa Barbara, CA, the Custom 5 uses an alnico 5 bar magnet, nickel silver bottom plate, 4-conductor lead wire for multiple wiring options, and is vacuum wax potted for squeal-free performance.